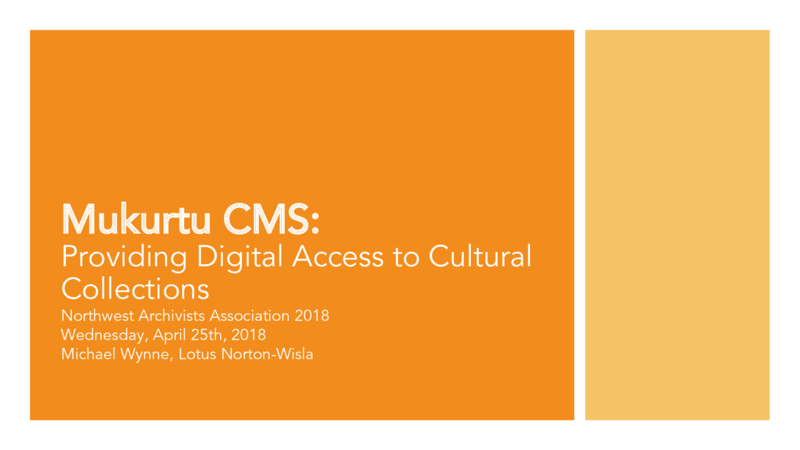 Mukurtu CMS is a free content management system that allows communities to preserve, share, manage, license and curate their digital heritage and stories using their own cultural protocols, languages, and social values. In this SHN sponsored Mukurtu CMS workshop, participants were shown demonstrations and examples of all Mukurtu's core features and tools including a dictionary and mobile application, as well as examples of Mukurtu in use in communities and institutions, emphasizing preservation strategies, cultural protocols and the use of Traditional Knowledge (TK) Labels. Participants took part in basic planning, description, and content creation activities. Instructors: Kim Christen, Michael Wynne, Lotus Norton-Wisla.